No clunky plug charging brick Or is the space between your outlets too small to connect two devices simultaneously You want to upgrade your outlets with USB charging ports in a clean and easy way... but replacing the outlet itself is a pain and adding a clunky, thick adapter is ugly. This USB wall plate cover solves all this for you. It is designed to make charging all your USB devices easy and convenient. 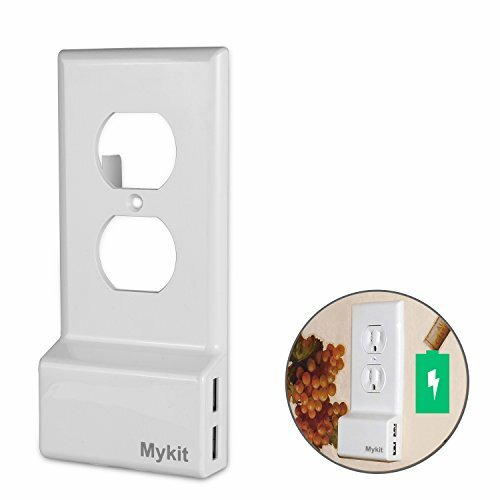 What's more, it leaves your wall outlets free so you can connect other devices. Just replace this USB wall plate charger with your current outlet cover and make your life tons easier. This wall plate with USB charger has an output power rating of 5V/3A that you can use to fast charge your devices. It is smart enough to detect the number of connected devices. If only one device is connected, it uses all 3A for an ultra-fast charging experience. If two devices are connected, it divides the current equally to charge both devices. It's perfect for charging all your devices. It also protects from overcharging and power surges. 1. Please pair the Duplex or Decor outlet type before order. 2. The Plate must be installed with USB port on the same side as the ground of the outlet.